October is a month of festivities as we celebrate Navratri as well as Deepawali in this month.both the festivals offer us ample opportunity to cook sweets and desserts and hence the theme surely is ‘Only’- Sweets and Desserts and the event will be hosted by a very talented blogger Gayathri of Gayathri’s Cookspot, do check out her blog for event details explained here. 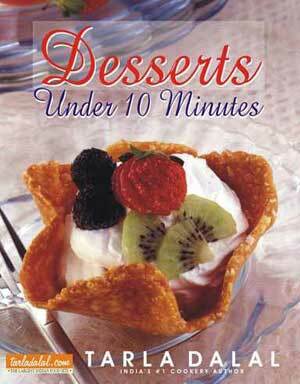 In this fast moving world we are always looking forward to cook in a short duration, and cooking desserts under 10 mins is a cookbook which surely is a way to impress our guests with exotic desserts cooked in a short duration. So what are you waiting for, try out traditional as well as new and innovative sweets/desserts and send them over to Gayathri and do not forget to leave the links here to win this cookbook. Good luck and enjoy this month of festivities. sounds perfect for the season. Dear Shabnam, if you are a blogger u can post the recipes in ur blog and then link it to my announcement and gayathri's event announcement and if u are a non blogger just send the recipe to either me or gayathri with a pic and we will post it for u.
I follow your space in friend connect and also like you FB page. Sent in my entry for the event. I'm already following you at google connect and now about to like your fb page. Here is my entry Pari..
heres my entries to the event!! Im your following you on friend connect and like your page in facebook. You got a wonderful space.Glad to follow you.Please do drop at my space. Already following you via google connect and now liking your FB page as well. Glad to participate in yet another lovely event of yours..
Hi,thanks for letting me know abt this Event Dear.I'm following ur blog through Google connect and also like your page on FB. Here's my entries for the Wonderful Event. Hope U will include my name in this Giveaway Event. I am following u through google connect and like ur facebook page. If any other requirements are there plz do inform me. Here is my contribution to the event. Liked you on fb and following your blog too.. I've just sent my entry to Gayathri. I'm following you publicly & have liked your page on Facebook. Hence, I am eligible for this giveaway. Here are my entries to your event.. I am a long time follower of your space and also "liked" ur facebook page. Following you already and love your page on FB :). Here is my 3rd entry. Somaas / Somaasi. Here is my 4th entry. Kaaju Katli. I have been following you publicly and have liked you facebook page. Here is the link of my recipe which I posted for your event http://hamareerasoi.blogspot.com/2011/10/humble-bengali-delicacy-narkel-chinir.html. And I have been following you for a long time :-) and liked your Fb page too. my 1st entry for ur event..u know I m already ur follower in blog n FB too.. Here is the link "http://ammajirecipes.blogspot.com/2011/10/kajjikayalu-somas.html"